Little Chief Big Cash has a problem. Click here to play! He has too much of two things: too much money, and too many people and coyotes trying to overrun his Band. Luckily, both problems were solved when you arrived with your gang of wildboys. Little Chief Big Cash has agreed to reward you with gold beyond your wildest dreams if you solve his other problems for him. You will receive payment for bringing back enemy tomahawks, cowboy hats and coyote skins. If you eventually wipe out all the threats to Little Chief Big Cash's Band, then he will reward you with his daughter's hand in marriage. She's the best looking woman in these parts, a real beauty who'll make the cash rewards even sweeter. Play the Little Chief Big Cash slots now to help the Chief in his dual plights of constant invasion and having too much gold. 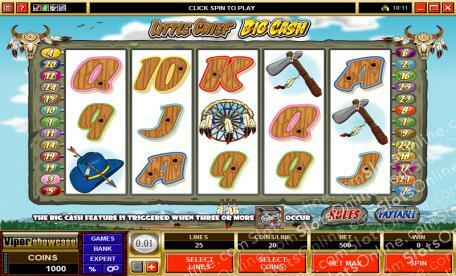 The Coyote symbol is the scatter symbol in this game, and it pays out on the total bet when 2 or more land on the reels. It also triggers the bonus game when 3 or more land on the reels. The Chief symbol is wild in this game, substituting for any symbol except the scatter symbol. The bonus is triggered by three Coyote symbols landing on the reels. In the game, 10 free spins are awarded and the player must choose 5 teepees, each revealing prizes or more free spins. Teepees are chosen until a coyote is revealed behind one of them. Prizes are doubled during free spins.